The embroideries of the workshop that became known as Savane Rutongo-Kabuye were created by a group of Rwandan women living in the aftermath of the 1994 Genocide Against the Tutsis. They came from both sides of the conflict, yet they put the events of the past behind them to work together in the hope that their children would have a better future. Their workshop was begun by Christiane Rwagatare, a native Rwandan who wanted to help put women back to work in the aftermath of the genocide. Their first workshop was a modest cinder block building in the village of Rutongo in the hills above Rwanda’s capital, Kigali. It was in Rutongo that their techniques and style was developed and honed. It was here that they produced works of textile art that would would eventually be featured in the Rwanda’s National Art Gallery. In 2010, curator Juliana Meehan discovered the embroideries of this collection in the small tourist shop run by Christiane called Mode Savane, which literally means “Savanna Style,” a nod to the lush grasslands of Rwanda. Meehan noticed that the works were not signed, and she urged the artists to begin signing their art. They agreed, however, because theirs is a cooperative undertaking–certain women draw the designs, others embroider the colors, still others wash and stretch the final piece–they rejected the idea of signing individual names on their works. Instead, they chose to sign as a group with the name Savane Rutongo, combining the name of Christiane’s shop with that of their village, Rutongo. 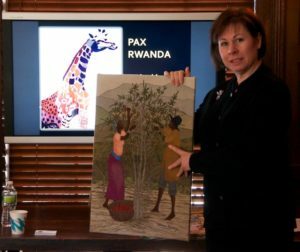 Many works in the PAX Rwanda collection are thus signed Savane Rutongo. In 2014, the workshop moved to the town of Kabuye, and the artists began signing their works Savane Kabuye. Recently, in 2015, several artists who had quit the workshop and moved to the capital, Kigali, rejoined and began signing their embroideries with the name Savane Kigali. In the present collection all three names are seen. The exhibit title PAX Rwanda: Embroideries of the Women of Savane Rutongo-Kabuye reflects this evolution of names. Although it may be confusing at first, it actually provides us with important information about where the pieces were produced. Savane Rutongo-Kabuye is one of many collectives of artisans that reflect a larger phenomenon taking place all over Rwanda: reconstruction, reconciliation, and the desire for peace. Like that of all Rwandans, Christiane’s story is tied to Rwanda’s turbulent history. She and her family fled to the Democratic Republic of Congo (formerly Zaire) to escape the turmoil that plagued Rwanda for decades, and she lived there for most of her early life. She traveled to Romania for her college education, and while there she studied European embroidery as a leisure pursuit. Upon returning to Rwanda in 1994 after the Genocide, Christiane met a group of women in Rutongo who were trying to earn a living by embroidering tablecloths and other small linens. Recognizing their skill and desiring to help in Rwanda’s reconstruction, Christiane conceived the idea of a workshop where, together, they could create full-scale works of greater value, far surpassing what she had learned in Europe. She announced that she would be starting an embroidery workshop, and asked that anyone interested should come to the village church on a particular day. Approximately 100 women answered the call! Unfortunately, she was only able to hire a small number of women. After viewing samples of their work, she chose the 15 whom she felt were the most talented. The embroideries in this collection are the realization of her vision and the fruit of the labor of that original group of talented, hard working women. Christiane sells the embroideries in her shop, Mode Savane, in the capital city of Kigali. There she also sells handicrafts and provides custom tailoring to residents of Kigali and tourists. 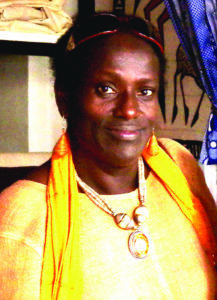 Christiane and the women of Savane Rutongo-Kabuye have won awards for their work in Rwanda, but only recently have they received attention outside of Rwanda. This exhibit’s curator, Juliana Meehan, teaches reading and writing to sixth grade students at Tenafly Middle School in Tenafly, NJ. She holds bachelor degrees in English literature and anthropology and a master’s degree in reading from William Paterson University, Wayne, NJ. Upon visiting Rwanda in 2010 as a tourist, Juliana entered Christiane’s shop, and first beheld the embroideries in this collection. Finding them extraordinary, she promptly bought several of them and later learned the full story of how the works were created by the talented women trained by Rwagatare. Since returning to the States, Juliana’s goal has been to bring these works to the attention of the American public. She sustains the workshop by regularly purchasing embroideries at prices set by the workshop and exhibiting them, telling the story of the remarkable women who created them. The works have been shown in museums and galleries in New York, New Jersey, Ohio, and Washington, DC. Juliana lives with her husband John and her dog Chloe in Bogota, NJ.